of Urdu, Hindi, English and Marathi. 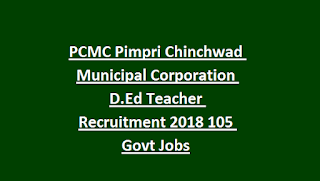 There are total 105 vacancies available in this current recruitment of PCMC D.ED Assistant Teachers and Graduate Teachers. Interested and required educational qualification meets candidates can submit their application form in prescribed format to PCMC on or before 14-12-2018. This is purely contract based recruitment only. For more details regarding PCMC Assistant and Graduate Teachers recruitment please see the below given details. Last date to receive the application form to PCMC office is 14-12-2018. 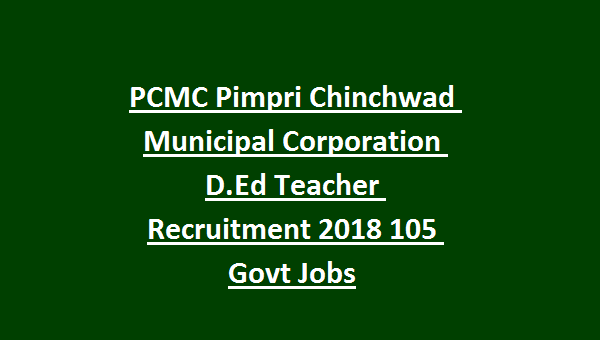 There are total 105 vacancies available in this current recruitment of PCMC B.Ed Graduate Teachers and D.Ed Assistant Teachers. 18-33 years for general candidates. 18-38 years for reserved candidates. For Assistant Teacher-Candidate must have qualified H.SC with D.Ed and TET. For Graduate Teacher-Candidates must be Graduate with B.Ed Qualification in respective subject in respective medium with TET qualification. For details and more clarification please refer the official notification. Selection for these Teachers recruitment of PCMC will be held through merit in their academic qualifications and TET marks..
For more information please see the official notification.